Here’s a question for you: this is obviously and all-Google solution and though we generally focus on Google either exclusively or try new tactics there first, its nice to also have capabilities for other engines. – if you’ve tried this, are there any performance issues you need to look out for? Glad you like the post Paul. Yes this is very possible. I have done it many times before. In fact, most of the Zen cart sites I work with currently have Google, Yahoo, and MSN tracking installed. After I get through the “Google” post series here I’ll schedule to touch upon those other systems as well. Keep in mind though that you have the ability to setup Cross Channel tracking with Google Conversion Tracking already (no need to insert additional tracking code on your pages to get it working). Setting up Cross Channel tracking allows you to track multiple paid search campaigns from sources other than Google, all from within the Google Analytics interface. I have used this method as well (and current am on a few Zen sites) with great success. The only draw back to it is that this method, although it provides conversion analysis on a broad scale, is that is does not provide the detail you get from the “actual engine tracking systems themselves”. But it does provide enough high level detail to allow you to find out if your campaigns are converting at respectable levels. if you’ve tried this, are there any performance issues you need to look out for? I have not noticed any real performance issues with the sites I use it on currently, however, keep in mind that the more tracking codes you add to any site, the more of a performance hit you may take (as most rely on contacting a server external to your own). 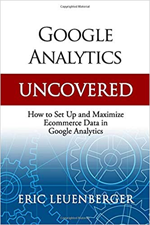 My new workbook to be released soon focuses on Google Analytics only because it is one of the most popular “free” tracking systems right now which offers good reporting. It is worth touching on the other engines as well though because they all have their own unique benefits. Thanks Eric. I have cross-channel conversion enabled for our site as well, but the requirements for generating tracking url’s to the keyword level out of Google to us eon other engines always seemed far harder than hitting the conversion page with extra code. Is there a way to make that easy? Unfortunately, there is no “easy way” to do that to the keyword level. You are right about that. 1. It should work but you should upgrade go the newest version. The one you have is very old. 2. Conversion tracking is for ppc tracking. So if you don’t first click one of your ppc ads before you purchase, it won’t (and shouldn’t) register the conversion. 3. Ecommerce tracking is different than conversion tracking. So long as you have ecom tracking activated in your google account it will track. 4. If you still see the ‘ua xxxxx’ then your tracking id has not yet been set for google analytics. That needs to be set for ecom tracking to register. I’m upgrading to the latest version 1.39h very shortly. As I understand it it should take several hours minimum. Not something I’m looking forward to, but it definitely needs to be sorted. The UA-XXXXX has been replaced with my analytics code I just didn’t want to publicise the code over the forum. I am using PPC. In Adwords I can see it working correctly as it registers a conversion “count”. So it tells me how many conversions there are, what percentage of clicks are converted and also the cost per conversion for specific keywords. However, adwords does not provide any specific details as to the transaction value or the products ordered. I assumed by linking adwords with google analytics, I could essentially track the sales value and product name/SKU for the PPC transaction as normally on Google analytics. This is not the case. In the adwords section on Google analytics it registers the costs for my PPC program, however has registered zero transactions and essentially saying I have minus 100% ROI. I know this to be wrong because in Adwords I have registered several conversions. http://www.mywebsite.com: 100% £5k transaction value. I think there is something wrong with the setup. Could this have something to do with me being on a shared server and using paypal express? I think google anlytics is such a great tool. But its a shame its so diffult to set up! I’ll consider reading your book on analytics but could it solve the problem I am facing? Point 3. Eccommerce is setup. But like I said above it is showing 100% of the sales through mywebsite.com referrals and zero through any other referral or search engine channels.